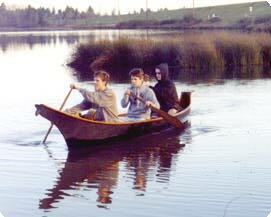 Two Moons is a replica of a Makah Indian cedar dugout canoe. This was my first coastal canoe replica. I built it in 1990 for my family's use. The name comes from one of my sons. When he was 5 years old he held a half circular shaped rock up toward the half Moon in the sky and said "Look! Two moons." I said "Someday I am going to give that name to a boat that I build." The design is based on measurements taken of a Makah dugout canoe at Neah Bay Washington in 1880. The Makah canoes had the reputation of being very seaworthy. The original canoes were carved out of cedar logs. They had flat bottoms and straight sloping sides so the design could be duplicated fairly well in plywood. I plotted the measurements in a CAD program on my computer to make the plans for this canoe. I next used a program that I wrote myself to find the shape of the plywood planks that would form the hull. 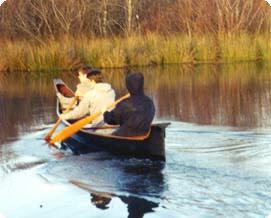 This canoe is made from marine plywood bonded at the seams with epoxy and fiberglass using the taped-seam method. The flat bottom transitions into a "V" shape at the bow and stern. The bow & stern decorations are hand carved cedar. Two Moons is a union of ancient knowledge and today's techniques. Modern materials produce a strong low-maintenance structure, centuries of refinement by the Makah carvers and the other Native American people of the Northwest Coast produced a highly efficient and spectacularly graceful design.